Climate change. It is in the news all the time. We hear about being prepared as an individual, a family, a community. You don’t hear as much about preparing your business – particularly your “small” business. Before you get offended, when we say small business we are talking about those businesses that are solopreneurs, or have small teams, and don’t have a dedicated person or team to think and prepare for these things. No worries – we are here to help you. Backup your data online. All the time. And in multiple locations. We suggest 2 sets of (current and ongoing) backups. An external drive so that if your laptop or desktop croaks (says the woman who is dealing with this right now) you just need to plugin the hard-drive into the new device and you are back-in-business (without the associated time of restoring from backups). Also backup your desktop, laptop, hard-drive to to cloud. We recommend BackBlaze for this. The beauty of backing up to the cloud is that you have access to it no matter where you are. If you have to evacuate at a moments notice and cannot grab your tech, you can still access your data from a remote location (like a library). ** Bonus Tip ** Do not forget to backup / synch your phones. Document your business procedures to help you delegate tasks. Instead of carrying all the details of how your business operates in your head, document all of your processes and procedures (how to onboard clients or team members, how to bill clients, pay invoices etc.) so that everything you need is in one place. We recommend Evernote for this. Create your lists, tasks, checklists and have them available to you (and others) no matter where you are. ** Bonus Tip ** Evernote is our go to tool for so much more (see below)! While you are documenting …. do you know what software, tools, utilities, and browser apps are installed on your computer? Make note of these, along with the license number and the email you purchased them with. Take is from someone who has first hand experience with this … when time is of the essence and you need these tools to effectively run your business you don’t want to mess around trying to track these details down. Make sure that any install files are “in the cloud” so they can be access from anywhere (sensing a theme here). We love Dropbox and Google Drive for the virtual storage (and sharing) of all our business (and personal) digital assets! Keep vital contact and access information updated and virtual. Evernote is brilliant for storing your vital business (and personal details). Birth certificate, credit card and passport numbers. Details on insurance plans, business assets (model and serial numbers) and so on. Use LastPass for all of your passwords. This app works on desktop and mobile devices and we cannot imagine even beginning to remember all our accounts and passwords without it. ** Bonus Tip ** In addition to keep your everyday contacts on your phone (and backed-up to the cloud of course), make sure you also have police, fire, ambulance, consulate, FEMA, etc. in your phone as well. Create an emergency communication plan. This is not just for your team members, but also for customers, suppliers, and your general business community. It in not just about the tech, it is also about keeping your contact lists up-to-date, including alternate contacts and contact methods (like texting and social media). For the tech, you can use Sideline or Google Voice to have a second “virtual” number to use as a business number. ** Bonus Tip ** You should have this is place for your personal life as well. Have an alternate Internet access plan. Depending on the situation, you may be able to purchase Internet access at the hotel. You may also be able to access Wifi at a local coffee shop. Keep in mind that you may be competing with dozens (or more) of other people in the same situation as you and, if your business depends on it, don’t depend on these. Check with your local mobile or Internet service provider on options they may have available. Despite the use of technology everywhere … we still have an (unhealthy) dependency on paper. What paper based processes does your business run on? Do your bills still come to you on paper? Do you manually sign contracts and send them off via postal mail? What about faxes (please tell me you know what a fax is) – do you still use this technology? Inventory these when you are documenting your business processes (above) and transition these to an electronic solution. Remember post offices and courier services may be impacted during a disaster and may be one of the last things restored to normal. Have a GO bag or at least a checklist at the ready. Make a list of what you need to grab if you have leave your office. Phone, laptop, tablet, hard drive. Chargers, adapters, cables, headset. Computer glasses. Camera. Do you have a notebook or daytimer that you use? What about a couple of pens, pencils? When the time comes, you are not going to be focused and you want to be able to pull this list out and follow it. Recently, Nationwide conducted a survey of small-business owners on the subject of disasters and preparedness. The results were shocking. A whopping 38% reported that disaster recovery plans were not essential for their business. Only 18% had a disaster preparedness or recovery plan in place. With escalating weather patterns and rampant wildfires making headlines daily, there should be no question as to whether your small business needs a disaster recovery plan. 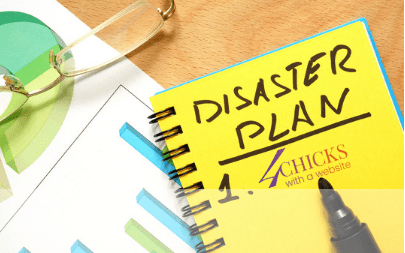 If your business is not ready to handle a “disaster”, yours may just become one of the unfortunate 40 percent of businesses that never recover after a disaster. So, it’s time to ask: Is your business prepared?